The ABC Television Network has announced midseason premiere dates for new series Of Kings & Prophets, My Diet Is Better Than Yours, The Catch, The Family and new comedy The Real O'Neals. Season premiere dates were also announced for returning favorites The Bachelor, Beyond The Tank, Galavant and Marvel's Agent Carter. They will join the schedule with acclaimed series American Crime, previously announced to make its second-season premiere Wednesday, January 6 at 10pm. As for current series, the mid-season premieres are as follow: Tuesday comedies The Muppets and Fresh Off the Boat will return with all-new episodes beginning Tuesday, February 2. The TGIT lineup of Grey's Anatomy, Scandal and How to Get Away with Murder returns with all-new episodes Thursday, February 11. Once Upon a Time and Quantico return with all-new episodes Sunday, March 6. Marvel's Agents of S.H.I.E.L.D returns with all-new episodes Tuesday, March 8. Nashville returns with all new episodes Wednesday, March 16. The rest of the current ABC series will run all-season long, like ABC Wednesday and Friday comedies, Castle and Shark Tank. Season 22 of Dancing with the Stars premiere date will be announced at a later date. And the return of Secrets and Lies and new comedy Uncle Buck's premiere dates will also be announced at a later date. It's beginning to look and sound a lot like Christmas on getTV, as the network presents a month of classic Yuletide specials hosted by some of Hollywood's most legendary variety stars, every Wednesday from 8 p.m. to 11 p.m. ET, from November 25 through December 23. As part of the festivities, getTV will also air a Christmas-themed Monday Night Variety Block packed with holiday episodes of The Judy Garland Show, The Andy Williams Show and The Merv Griffin Show on November 23 at 8 p.m. ET; as well as a comprehensive 30-hour marathon featuring all of getTV's holiday specials, starting Christmas Eve at 12 p.m. ET through Christmas Day at 6 p.m. ET. The specials are all part of getTV's continuing efforts to unearth rare Hollywood classic movies and TV, and many of them, including specials from Bing Crosby, Danny Kaye, Andy Williams, Perry Como, and Mitzi Gaynor, have not been seen on television in decades, often since their first broadcasts 40-50 years ago. The Yuletide celebration begins on Monday, November 23, with the star-studded holiday episode of The Judy Garland Show at 8 p.m. ET, which airs weekly in the same time slot as part of getTV's Monday night block of variety programming. 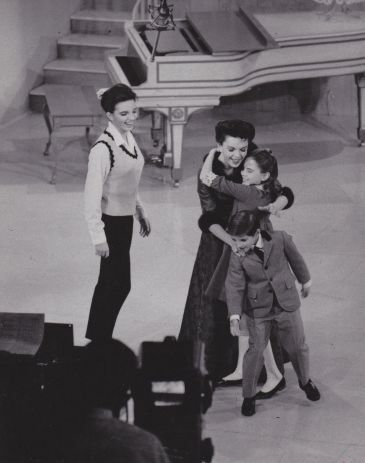 Guests include Garland's children Lorna Luft, Joey Luft and Liza Minnelli, as well as Jack Jones, and Mel Tormé, who performs his own legendary composition, "The Christmas Song (Chestnuts Roasting on an Open Fire)." Judy herself performs carols such as "Winter Wonderland" and "Have Yourself A Merry Little Christmas," the iconic standard that she first introduced to the world in the 1944 movie Meet Me In St. Louis. Next, at 9 p.m. ET, Andy Williams highlights some of his favorite Christmas moments in Happy Holidays: The Best of the Andy Williams Christmas Show, packed with holiday standards such as "It's The Most Wonderful Time of the Year," "Ave Maria," and more, along with unforgettable duets as Andy and his brothers harmonize with the Osmond clan. And Merv Griffin closes out the evening with guests Florence Henderson, Barbara McNair, and Jimmy Boyd singing his signature song "I Saw Mommy Kissing Santa Claus" in a special Christmas edition of The Merv Griffin Show, at 10 p.m. ET. For a complete schedule of films and times, visit www.get.tv/schedule. In addition to airing these films on the dates noted above, some of the specials mentioned are scheduled for further broadcasts throughout the month.